An Ohio child has passed away, five years out from being diagnosed with ALL which his parents decided to treat holistically. Eleven-year-old Noah Maxinâ€™s funeral is today after losing his struggle with leukemia, a fight that included the court battle his parents won for the right to decide how to treat their sonâ€™s disease. In 2002, doctors diagnosed Noah with acute lymphoblastic leukemia. 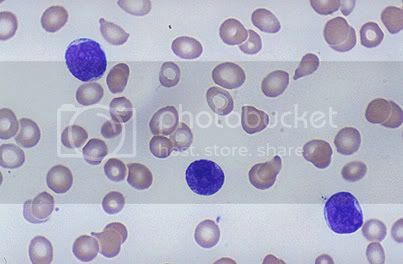 Abnormal white blood cells were gathering in his bone marrow, crowding out red blood cells, platelets and healthy white cells and leaving him at risk of infection, anemia and bleeding. Noah began a treatment plan that included a blood transfusion, drugs and other measures. The cancer went into remission. Noahâ€™s parents stopped the chemotherapy three months into a 31â„2-year plan favored by doctors at Akron Childrenâ€™s Hospital. The Maxins said they were concerned about the long-term effects of chemotherapy and wanted to treat Noah with a holistic approach that emphasized improved diet and strengthening the bodyâ€™s immune system. Another doctor took over his care. Acute lymphoblastic leukemia is the most common cancer of childhood. As such there are an amazing number of summary resources available on the disease. The National Cancer Institute hosts a great site, eMedicine provides a run down for ALL both in adults and in children, both the New England Journal of Medicine (available for free with registration) and the Lancet Oncology have published amazing summaries on current pediatric ALL and its treatment. Being the way in general with leukemias and lymphomas, ALL is a really heterogeneous disease. As such, we don’t know a whole lot about what Noah Maxin was facing. What was his circulating blast count a week out? What about blast % in his marrow after a week in remission induction therapy? After two weeks? What about minimal residual disease? Good prognostic measurements. What was the cell line and the cytogenetics or possible chromosomal abnormalities? Even if we did we wouldn’t be able to say whether he would’ve survived (longer) with a traditional therapy plan. On top of that, personally I know even less. All that laid out though, I still think Noah’s death is made a little bit more tragic by the positive signs in the story. At 6 or 7 Noah was in a pretty good age range to get ALL (if he had to). As an independent factor Noah’s age probably heralded a chance for 5 year survival greater than 80%. As the story makes it sound the numbers associated with the ‘remission’ of Noah’s leukemia were good enough to encourage his parent’s to abandon chemo. And he apparently achieved that remission within the first round of remission induction therapy. Recent improvements in treatment have clearly reduced the risk of adverse sequelae in children with ALL who have completed treatment. In contrast to the cumulative risk of approximately 25% at 5 years among patients treated in the early treatment era at our center or elsewhere only 14% of patients developed any adverse event at 5 years (17% at 10 years) in this large cohort receiving treatment in the modern era. But while that explains their actions, it is far from excusing them. The question of course is, should his parents have been allowed to move him onto such unconventional treatment? [Orac's Response:] I don’t know exactly what sort of woo Noah’s parents chose for him, but I would argue that using naturopathy against cancer is not all that different in efficacy from the treatments that a shaman or witch doctor would provide. In any case, even though Noah was off his chemotherapy for only four months, his tumor returned. By the time his parents turned back to conventional medicine, it was apparently too late. The choice made for Noah by his parents was almost certainly a death sentence. Untreated, even after induction achieved remission, Noah’s leukemia was going to be fatal, wasn’t it? And whatever holistic plan his parent’s jumped on was no different than forgoing treatment altogether or as Orac says, going to a witch doctor or shaman. Before children attain a level of competence and autonomy (defining that is another debate altogether) I think parental rights are pretty broad. And, as laid out in plenty of other posts, I’m offended by government paternalism. I shout all day about how there are no such things as positive rights. Children are a special case. There are things required by children, owed to children. Everyone can nod their head that there is criminal liability in a child starving because a parent doesn’t feed him or her. So, clearly there are parental sins of omission which warrant government stepping in…even before the fact, as in Noah’s case. When judging parental actions (or inactions), the bar needs to be drawn high, to protect parental rights. It needs to be dumbfoundingly obvious that something bad will happen. Only then should the government act as child advocate at the expense of parental rights. But doesn’t denying your child cancer treatment rise to that level? Look there are cases where a teenager or young adult is legally under his parent’s thumb but where that “kid” has a level of self awareness and autonomy to make their own medical decisions. And despite the fact such decisions are sometimes times merely a reflection of their parent’s thinking, they deserve to be able to do that. The points above are moot once a child attains autonomy. But at Noah’s age that doesn’t even come into play here. I’m pretty disgusted his parent’s were allowed, under law, to put Noah on a holistic treatment regimen, when there was little scientific question about the outcome. I adore your wp template, where do you get a hold of it from?